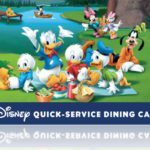 As an American Disney fan, I was honored to have the opportunity to not only visit Disneyland Paris as my very first international Disney Park but also dine at one of the restaurants at the resort’s Disneyland Hotel with very good friend of mine. Inventions is one of the two lovely restaurants inside the beautiful Disneyland hotel, the other being California Grill. 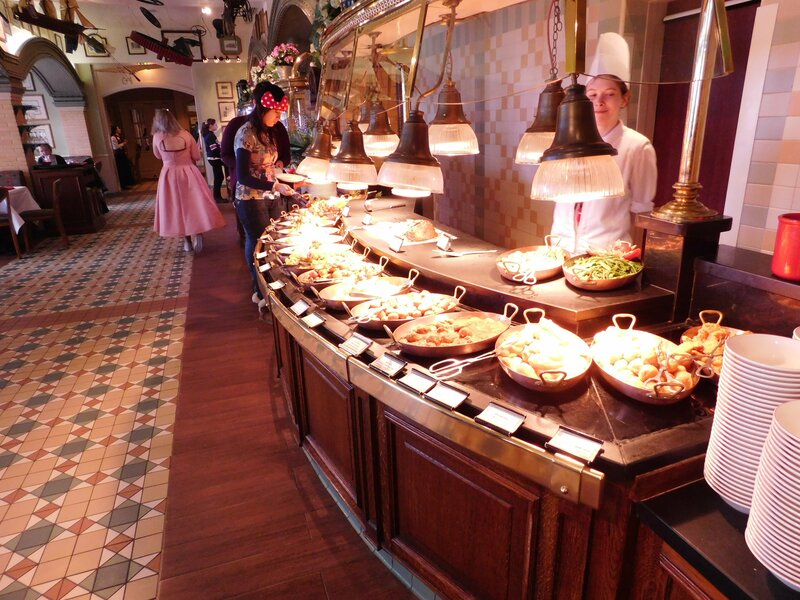 According to my friend who had booked the reservation, Inventions is known for its themed Sunday brunch buffets. The theme for the brunch we had attended was “Spring.” Simple and straight forward. 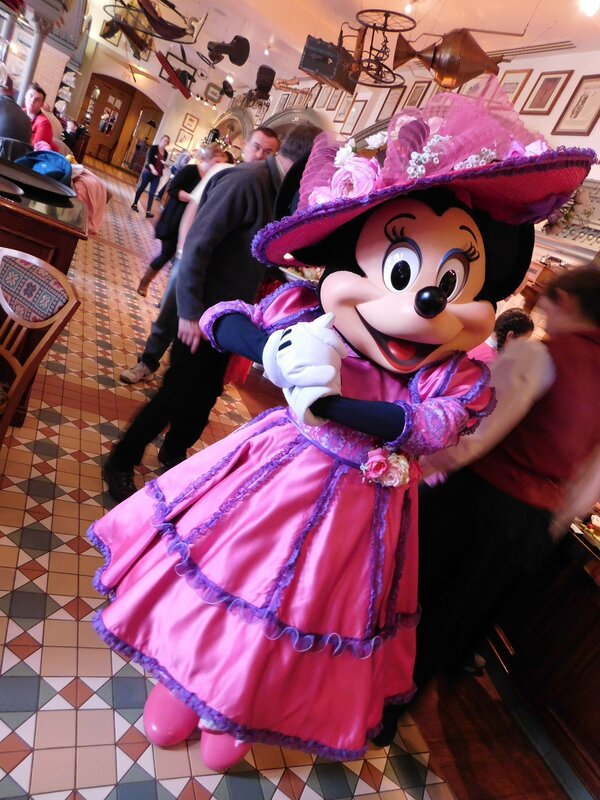 What excited us was that it was a character buffet as well and if the characters were to be dressed in the spring and Sunday best, then so would we. 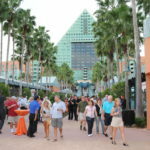 When we first arrived we had a chance to explore the Main Street Lounge which is outside of the restaurant. It was very quaint and well themed. It gives you the sense of sitting in a living room of the time period. Once we entered we were greeted by Cast Members who seated us in the room where the buffet was, which was extremely lucky for us. There were two more dining rooms in the restaurant which were very spacious and were connected by long hallways which led to our dining area that was also the buffet room. These rooms gave great views of the main gate entrance, Sleeping Beauty Castle and Space Mountain. On the ceiling hung antique machines such as typewriters, vacuum cleaners and even bicycles — hence the name of the restaurant — and it tied in so well with it. I personally loved it. Now onto what you really came here for: the food. 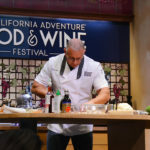 I have eaten at some really great Disney restaurants at both Disneyland and Walt Disney World, but this place had the absolute best food and set up I had ever had the honor of experiencing. Our table was set up with tablecloths and wine glasses, along with complimentary champagne and a basket of bread. Let me note that you only get one free glass of champagne, however, my friend had spilled hers by accident and they were kind enough to give her another free of charge. We were also given water as well with the option of tap or sparkling. 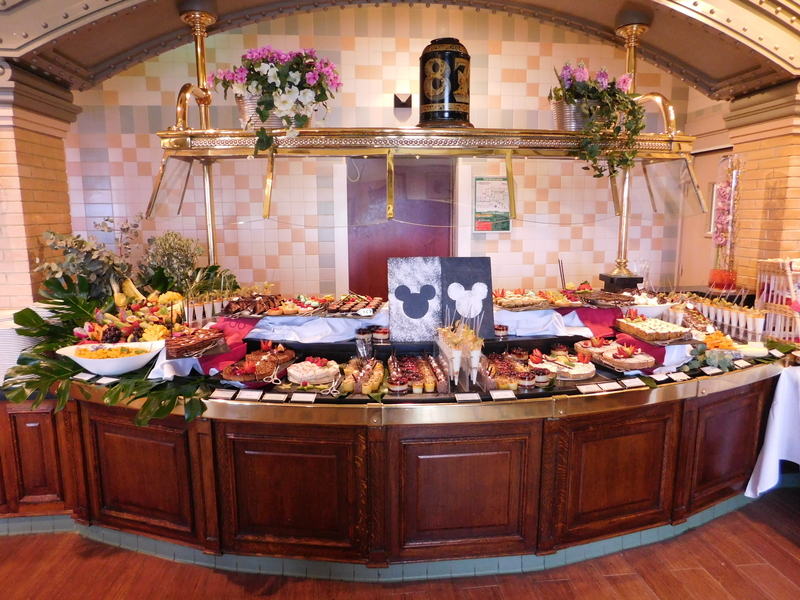 Again we were blessed to be able to be seated in the buffet room because it literally takes your breath away. The set up was just super impressive and inviting. 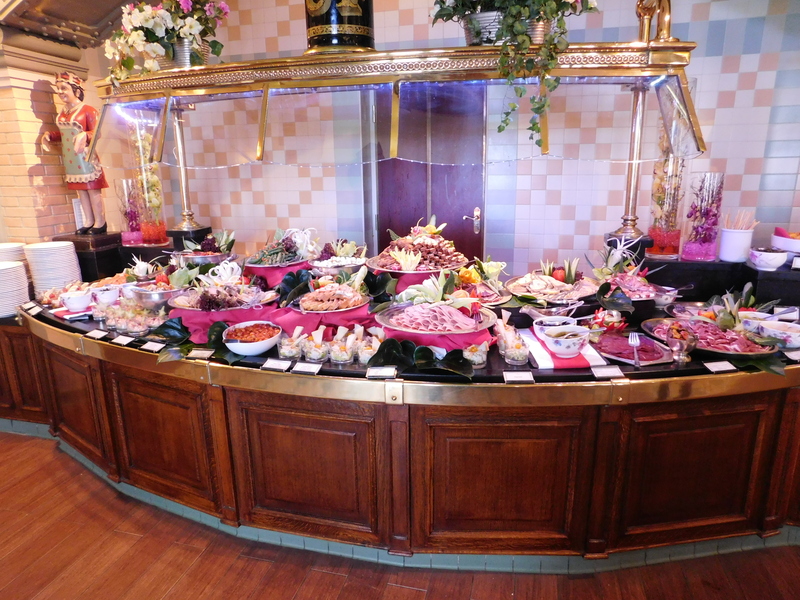 They had the five areas of the buffet set up for guests: the salads and cold dishes. 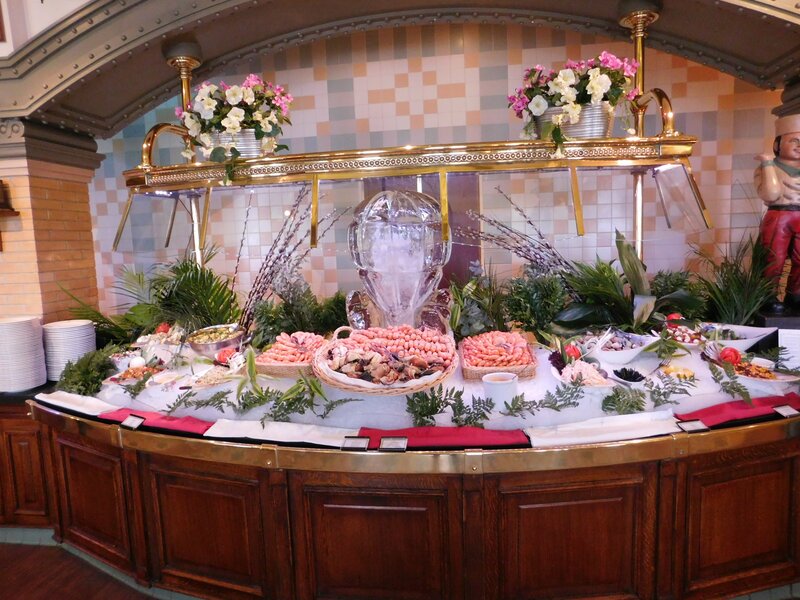 Seafood, Hot food, meats and cheeses and dessert. They also had a section for children’s’ foods as well. The first section, cold dishes and salads, held fresh toppings for all your salad needs laid out in such an enticing setting as all the food was. It included asparagus, tomatoes, mozzarella, parmesan, tiny cups of dressing, and what I believe to be salsa but my friends had a tough time figuring out what it was (other than delicious). Part of the cold buffet included chicken, ham, turkey, macaroni salad, smoked salmon, individual cups of Caesar salad, They also had a variety of sauces. The seafood salad may have been my favorite part of the buffet besides the dessert. My hometown is a seafood town and I must say I was very impressed by the spread. It included the hugest peel and eat shrimp I had ever seen, prawns, snow crab legs, escargot, crayfish, lobster, mussels on a half shell, and even a seafood salad that would have made my grandmother proud. The hot food section was yummy I must say. They had a variety of beef and duck dishes but the carved lamb dish was the epicenter of the section. All of us fell in love with the sautéed potatoes and green vegetables. They also served spaghetti and meatballs, mozzarella sticks, fried shrimp, different types of pizza, and fried bass. I am assuming the following foods were for children attending the brunch but I ate some anyway: chicken nuggets, chicken cutlets, macaroni and cheese, cheese pizza, mickey shaped potatoes, and plain spaghetti with the option of adding red sauce. They had fruit and veggie options available as well. I sampled a few and my friend Jess, who is vegetarian, enjoyed all the options immensely. I really loved the fruit salad that was set out for everyone. It included loads of melons and pineapples (my personal favorite) along with apples and slices of orange. I have to promote the asparagus here again because it was just simply delicious. And last but not least, the dessert! It was like I was in heaven! A wide variety of brownies and cakes including a delicious strawberry cheesecake. 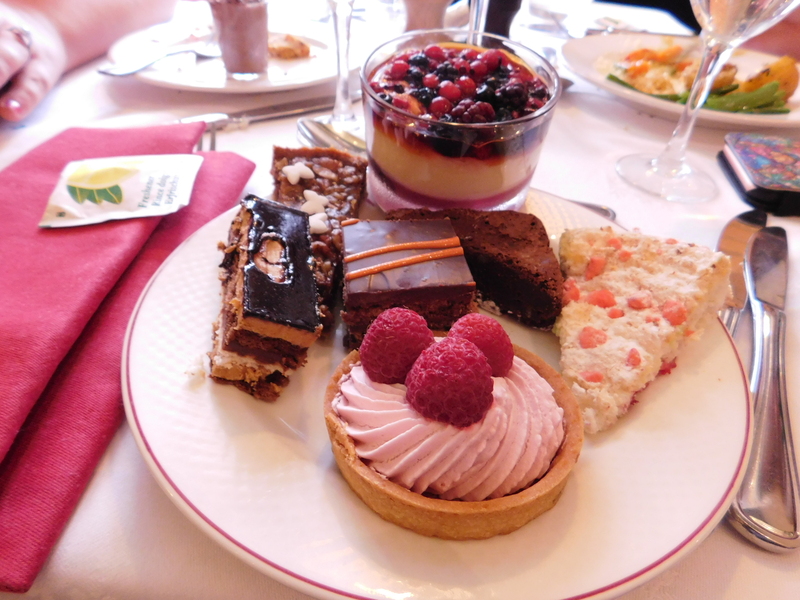 There were also berry tarts, yogurt cups, madeleines, raspberry and blueberry crème cake, pots de crème, chocolate eclairs, French doughnuts with assorted sauces, and wrapped candies and lollipops. The characters they had for the brunch was very fun and interactive! 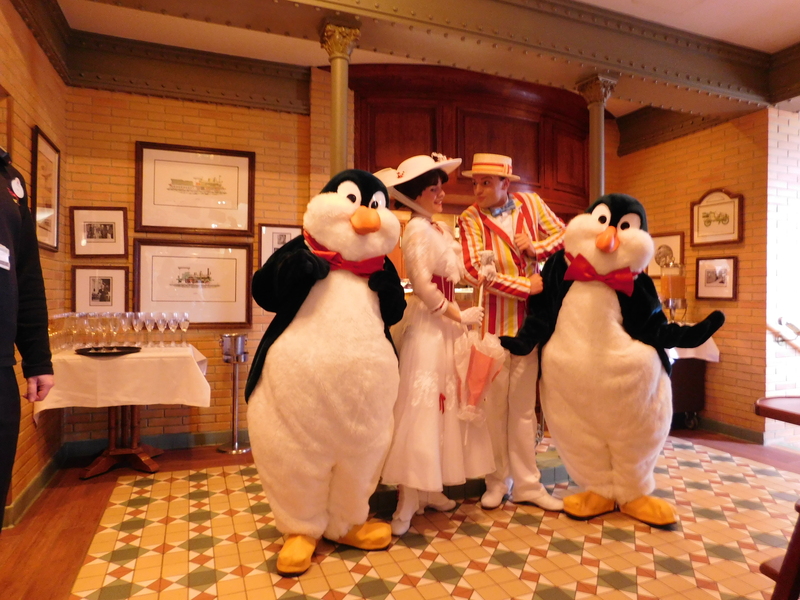 Characters invited to the brunch were Mary Poppins, Bert and their penguin friends. It also had Mickey, Minnie, Goofy, Pluto, Chip and Dale dressed in their Swing into Spring outfits and looking mighty dapper. They were very fun and although they had many people to visit they took a decent amount with time with each table — no love and shove with these characters. Since we had just recently bought our Disneyland Paris annual passes we were fortunate enough to receive a small discount for our meal. Regular price for adults are 57 Euros ($64 US dollars) and 31 Euros ($34 US dollars) for children ages 3-11 years. In comparison to domestic Disney dining of this level, it’s about the same price. In conclusion this was worth every euro I spent and went beyond my expectations of Disney dining. If you ever have the chance to visit Disneyland Paris make sure you put this place on your to-do list.